Generalized Read-Across (GenRA) is a data driven approach which makes read-across predictions on the basis of a similarity weighted activity of source analogues (nearest neighbors). GenRA has been described in more detail in the literature (Shah et al., 2016; Helman et al., 2018). Here we present its implementation within the EPA’s CompTox Chemicals Dashboard to provide public access to a GenRA module structured as a read-across workflow. GenRA assists researchers in identifying source analogues, evaluating their validity and making predictions of in vivo toxicity effects for a target substance. Predictions are presented as binary outcomes reflecting presence or absence of toxicity together with quantitative measures of uncertainty. The approach allows users to identify analogues in different ways, quickly assess the availability of relevant in vivo data for those analogues and visualize these in a data matrix to evaluate the consistency and concordance of the available experimental data for those analogues before making a GenRA prediction. Predictions can be exported into a tab-separated value (TSV) or Excel file for additional review and analysis (e.g., doses of analogues associated with production of toxic effects). GenRA offers a new capability of making reproducible read-across predictions in an easy-to use-interface. 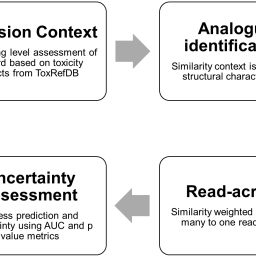 Helman, G., Shah, I., Williams, A., Edwards, J., Dunne, J. and Patlewicz, G. (2019) “Generalized Read-Across (GenRA): A workflow implemented into the EPA CompTox Chemicals Dashboard”, ALTEX - Alternatives to animal experimentation. doi: 10.14573/altex.1811292.